As Kamal Haasan contemplates a career in politics, many feel that it may not be an easy journey for the superstar. Haasan has not yet spoken about his ideologies, his intentions or the issues he would take up. All one can guess from the superstar’s meeting with Delhi chief minister Arvind Kejriwal in Chennai last week is that Haasan may piggyback on the issue of anti-corruption. “However, Haasan needs a good team and simply coming in the fray and saying ‘vote for me’, won’t work at all. We need to wait and watch what kind of team he assembles, who are the credible faces and people known to public,” says political commentator Sumanth Raman. The other theory that is doing rounds is that it is DMK’s political manoeuvrings which is making Haasan get into politics. DMK wants to stop superstar Rajinikanth’s entry into politics. DMK’s working president MK Stalin is worried that if Rajinikanth enters politics, it would be detrimental for DMK. Insiders say it was Udhayanidhi, Stalin’s son, who approached Haasan and brought him to Murasoli’s 75th anniversary celebration organised in Chennai by DMK in August. Haasan was one of the speakers at the event and sat beside Stalin. The party is now seeing a historic opportunity for itself as the AIADMK stands divided. In the process they don’t want any strong opponent like Rajinikanth as this could spoil their rosy future. Sources say, when Rajinikanth started talking about serious politics DMK people were worried about his impact. That is the reason why they approached Haasan. And the 62-year-old Vishwaroopam actor took it as an opportunity. 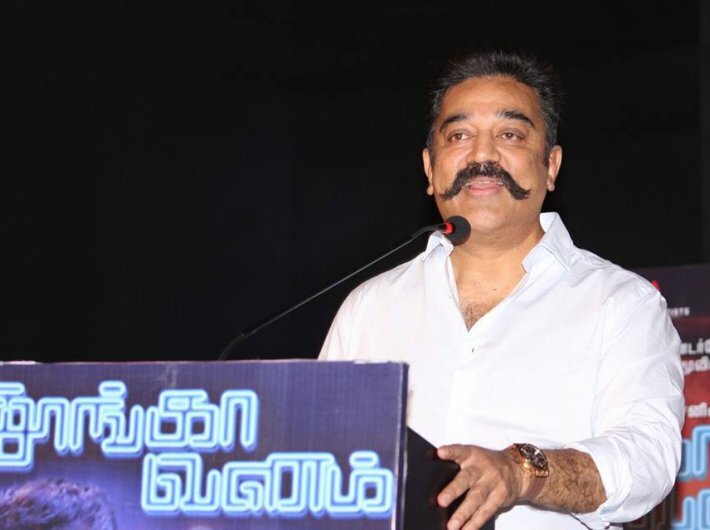 Some say Haasan is retiring from the film industry and thus politics is the next best option given the legacy of Tamil Nadu, the state which has closely connected film and political system.